Boy, I used to frequent Victoria Chinese Restaurant quite often before my food blogging. It happens to be my parents' favourite Dim Sum spot. I guess it's difficult to be a regular customer when I'm busy running around trying new places. Generally, Victoria is known for it's Dim Sum and wedding banquets. But little do people know, they also have all-you-can-eat hot pot. I've had it a few times and I find it a fabulous value since it's only $19.99. Tonight, we were invited (including my mom and dad) to a hot pot meal courtesy of the manager. I guess being a faithful customer all these years has it's benefits. 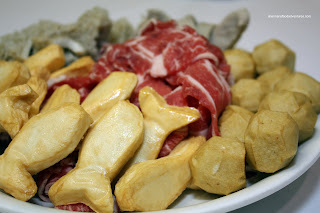 Of course, we made it clear that I could say whatever I wanted in my post about the hot pot. Viv didn't join us for the hot pot as she was eating out with some friends at Red Fort (formerly Rubina). As a side note, she and her friends were bitterly disappointed when they refused to accept more than one Entertainment coupon even though they had a party of 4. I find this act despicable since that is essentially a bait and switch. I mention this to warn others of their unethical business practices. I digress. Anyways, back to the hot pot. Similar to any other hot pot, you have to pay for the soup base. I know this sounds like an added cost on top of what you are already paying; but it just seems like an accepted practice. Personally, I'd prefer all hot pot places to just factor in the cost of the broth into the final price. We ended up getting the clear soup base and the spicy soup base. Unlike proper hot pot restaurants, there is no ventilation devices installed. Luckily, they have a very high ceiling (at least half of the restaurant) and the evaporated water has somewhere to go. Otherwise, the place might get quite hot. In terms of selection, there is an impressive checklist. We started with a plate of Fish Tofu, Fish Meatballs, Beef Tripe, Pig Stomach and Fatty Beef. Don't be fooled by the name, the fish tofu is made of fish and starch containing no real tofu. Despite this, I really like it since it's quite soft and butteryish (not a real word, I know...). 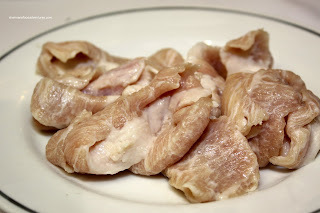 Both the tripe and stomach were in a shade of gray which didn't look at all appetizing. They were precooked since you can't soften tripe up in that short of a time. I think they should have eased up on the precooking a tad, there was no texture left in them. The star of the plate was the fatty beef. With a quick dip into the hot broth (once it changes colour, it's done, don't leave it in too long! ), it yielded buttery soft meat. The fish balls were fish balls, nothing more to say about them. 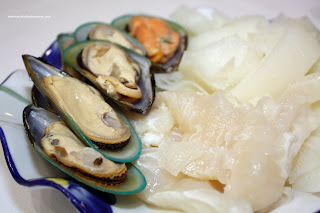 The next dish consisted of Greenshell Mussels, Bible Tripe and Fish Slices (Basa?). Nothing much to say about the mussels since they come precooked. The tripe was good. It was properly washed (lots of cold water rinsing), so that there was no gamy taste. The fish slices were not fishy and stayed in one piece when cooked. 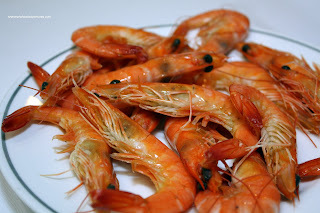 Continuing with the preco oked theme, the shrimp were not raw. They had already been blanched. Again, we can only guess that the reasoning behind this is to prevent spoilage or there was no fresh shrimp available. The final product was still sweet and had a chewy texture, so not a big deal I guess. The plate of pork cheeks confused me at first because it was pale and not pink like it's supposed to look. Again, the colour was probably the result of a baking soda marinade. No matter, I actually enjoyed the slightly crunchy texture once cooked. With Enoki and Shiitake Mushrooms with a side of Fried Wheat Gluten, we finally got a meatless dish. 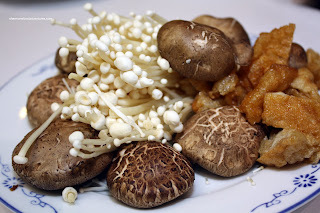 Mushrooms were fresh and devoid of dirt (hey, some places have really dirty mushrooms!). I love gluten, there is something about that chewy texture. Thus, I practically ate all of it. Not the healthiest thing; but I seemingly can't get enough of it. I used to buy the assorted gluten from Bodai and ate it all by myself! 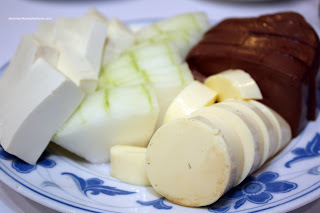 Alright, the last dish consisted of various items such as Pork Blood, Silk Tofu, Winter Melon and regular tofu. I know, the pork blood thing scares some people. Well, I happen to like it and I suppose if you never grew up on the stuff, it can gross you out just by looking at it. Nothing much to say about this plate really other than it did the job. We also had the Wakame Seaweed, Udon, Vermicelli, Chrysanthemum Greens and Watercress. The greens were fresh; but I wasn't a big fan of the seaweed. Personal choice really, didn't seem to go well with the hot pot thing. What we ordered was only a small sampling of the items available. For $19.99 and AYCE, it's a great value, especially considering the venue and location. Realistically, there are better hot pot restaurants around. Considering that Victoria is not an actual hot pot restaurant, they do a pretty good job in offering a good selection of items for a reasonable price. i've never had hot pot but it looks like fun. i like idea of cooking your own meat (fish, in my case) because many places overcook it. do most people use all the broth or is there usually a lot left over? Usually, most of it evaporates while cooking. However, they come around and refill the soup every now and then. Thus, at the end, in theory, you can drink it as soup (depending if you like what items had been cooked in it). The spicy soup is usually not touched since it's a bit too salty and spicy to drink. Yah, hot pot is fun. Nothing you technically couldn't do at home if you had the burner and pot. But, you wouldn't get the variety of items for the same price doing it yourself. That pristine white tablecloth could not have remained spotless for long! 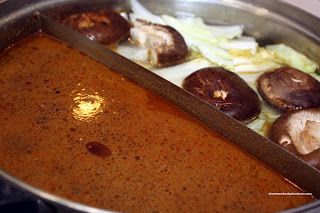 The veggies and tofu are my personal fave since they soak up so much of the broth - any recommendations for a vegetarian hot pot (with the spicy broth)? I didn't know about the hot pot here. 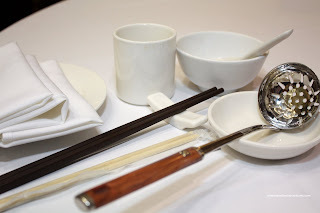 I go to Victoria all the time for dim sum--it's one of my favourite dim sum places. I'll have to check it out. Victoria's AYCE hotpot @$20 per pax is reasonable. Grand Honor Hot Pot @Granville is @$18. There is a new Korean bbq/hotpot place with built-in burner on each table @London Place, btw London Drugs and Empire Seafood, same floor.